Neon Sports Balls are made from the finest natural rubber, which has been especially formulated for durability. The brightly coloured balls are a fantastic choice as they are easily visible for you and your dog. 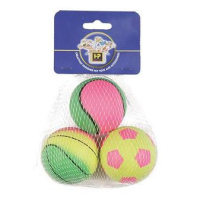 These long lasting sports balls are sure to impress even the most fussiest dogs. All three balls destroyed within one day. The balls were spongy type rubber, not hard. My three dogs (a weimaraner,a collie and a tiny fluffy crossbreed) all tore chunks out of the balls within minutes! Don't be fooled by the product description. These balls are made from shiny covered dense foam rubber that my gentle Belgian Shepherd tore apart immediately. Looks like the kind of material that could cause problems if swallowed so I have discarded. She has some Trixie Natural Rubber Rings that are almost indestructable and I had hoped these balls would be similar. These are not suitable even for a supervised game of fetch. Very disappointing.